Sjælsmark Barracks are located due north of Sjælsø in the rolling North Zealand landscape. They were designed by the architect K. Jensen-Gaard of the Defence Construction Service and built between 1952 and 1954 for the 1st Field Artillery Regiment to house just under 1,000 soldiers. This is a fine example of a defence facility elegantly blended into the landscape, where the architecture accentuates and supports the military functions. These were one of four army barracks built as part of the expansion of the Danish land defence at the start of the Cold War, when compulsory military service lasted 18 months. By the time of its decommissioning in 2004, around 60,000 healthy young men had done military service at this successful ‘recruits factory’. Sjælsmark barracks are distinctive in that the 18 billeting units containing the soldier’s bunkrooms, showering and polishing rooms form a long soft curve, defining the structure for the entire area. 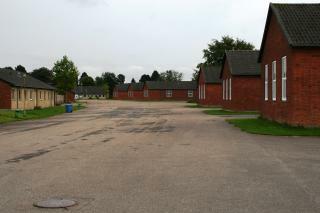 Behind this is a strip of administration buildings and a large mess, which is in turn flanked by workshops and garages. All the barrack buildings feature yellow brick facades and red gables. With green lawns and specimen trees, the exercise range is drawn in between the buildings on the barrack grounds, introducing a softening touch to the military ‘boot camp’ setting. The sleeping quarters were fitted out as tactical 10-man dormitories so that the men shared quarters and socialised with the same group they would be fighting alongside on the battlefield. Disobedient soldiers had the dismal prospect of a spell in the basement detention beneath the gatekeeper’s building.